← Happy day, happy tram. Just before Christmas, we stopped in at the Caves de Bailly where we annually stock up on Crémant de Bourgogne, Irancy, Ratafia, and Crème de Cassis. It’s literally a journey into the center of the earth, and even in the summer months, it’s best to go wine-tasting there with an extra sweater (or deux) to keep you nice and warm, as the temperature remains a wine-friendly too-cool-for-comfort all year round. At Christmas, deep beyond the tasting area, there’s a market that winds its way through the deep, dank passageways, lit by tiny white lights and the warm lamps of individual vendors. Handicrafts, fine angora wools, and local foods line the tunnels. This year, I gave my personal “most beautiful” prize to the organic cheeses—each more spectacular than the last—propped one against the other like common objects of no particular notice. No doubt dripping with flavor on the inside, they were crusted on the outside with the most spectacular array of mold and crud. Deep ochres, ambers, aubergines. Cinder-color, blue, and black. Like geodes from the earth itself, beautiful-ugly lumps of splendiferous yum. Our haul? An organic Tomme de Chèvre and something else quite delicious whose name I have already misplaced in the messy attic (or is that a wine cellar?) of my mind. This seems an excellent time to introduce you to another friend’s blog: Domaines & Terroirs. 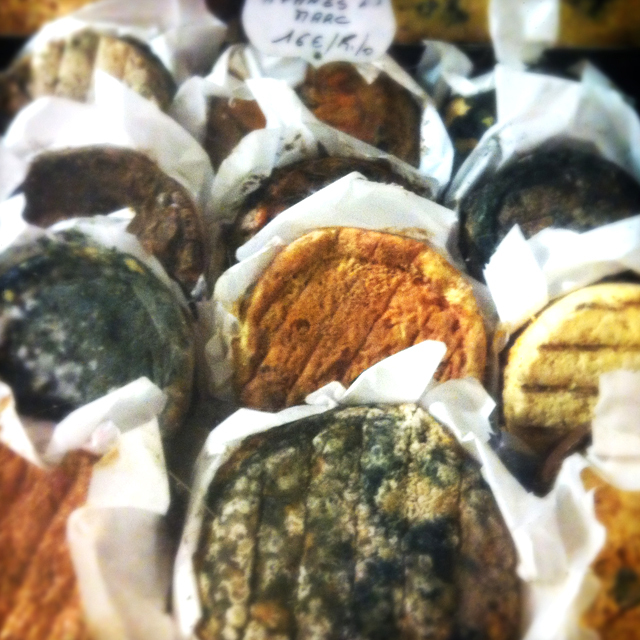 Here you’ll learn more about French cheeses than I could ever hope to tell you. Happy tasting, and happy holidays. This entry was posted in FRANCE, SAVORING and tagged bailly la pierre, caves de bailly, cheese, Christmas, France. Bookmark the permalink. Amazing! They look like little pies or cookies. How big are they in diameter? thickness? And they also look absolutely yummy! Thanks much. we thought it was bread or muffins. blueberries that had leaked into the dough. I look forward to every post! Plugged your blog in my end of year blog at http://www.designfaith.blogspot.com. Happy New Year. proper reflection. It comes in waves. Take care, and happy holidays. What fun it must have been there. Nice to hear from you. I used to be “afraid of mold”…so funny. You sort of grow out of it I guess. I had a butter story I wanted to tell you, which your blog brought to mind. My mother-in-law, who grew up during WW2 in France, hates to waste anything. One day, going through her fridge, I found some expired cream and I suggested she throw it away. (She needed reminders every now and then.) But she said, “No! It’s perfect for making butter.” I didn’t believe her. But a few hours later, she brought the butter to my house. How she’d agitated/churned it enough to make butter in her modern kitchen, I have no idea. But there it was. And quite tasty too. I then looked up butter-making on the internet, and was amazed to learn that, yes, it’s good to make with cream slightly past its prime. There’s a lot of old wisdom about food that we don’t “get” in more, in our bacteria-free, new-is-better world. I have just discovered your blog and wanted to let you know how much I enjoyed it. Isn’t it amazing that something that looks so strange on the outside can be so good on the inside. French cheese is just so delicious. I eat it every day when we visit Europe. Hey Charlotte – Thanks so much for introducing Domaines & Terroirs. We love your blog and look forward to the email notice that there is another glimpse into another life.